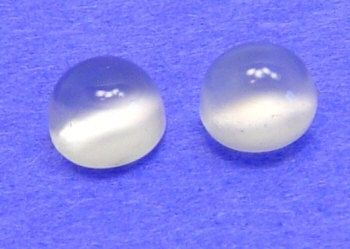 Moonstone is opalescent, with a blue or white scheen, sometimes called "schiller", resembling moonshine. Composed of albite and orthoclase feldspar, the albite gives it the bluish color. Pearl, moonstone and alexandrite are the birthstones of the month of June. Moonstone is a member of the Orthoclase gemstone family. AA Milky, transparent to opaque, medium dome.